Make sure that you’re unmissable with custom printed marquees. Our branded marquees are suited to all kinds of events in Sydney and Melbourne like outdoor fairs, exhibitions, sporting events, concerts, festivals and the likes. 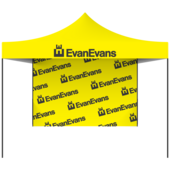 Evan Evans supply sturdy, functional and easy to use marquees with the highest quality printing that brings your vision to life. 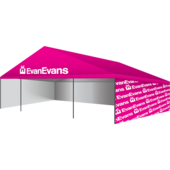 The printed graphics are long lasting and endure exposure to the outdoor elements, and with printed gables and pop up marquees to choose from, there’s an option for everyone and every brand. We love collaborating with you and helping you stand out from the crowd with awesome branding. So, get in touch – let’s chat about what we can do together.